MEDIUM BAMBOO FLOWERING WHISPER WINDCHIME. 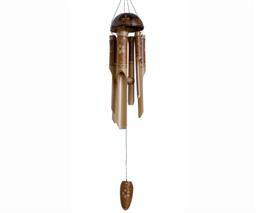 Our 17 inch coconut top simple wind chime has 6 hand tuned bamboo tubes. Each tube has a handpainted hibiscus flower on it.